Some of our homeless friends, most of whom have been mentioned in previous posts, agreed to have their pictures posted in this space. It was a great leap for Mark, who had come out to have breakfast with Scott and Carolyn this morning. Someone had woke him up and he was a bit annoyed about “being bossed around” but ate ravenously of the food offered. Every time he finished something, Scott was shoving another bowl or cup of coffee into his hand. Eggs, grits, muffins, coffee. Mark turns out to be a very good conversationalist once he gets to know you, but a lot of things turn out to be “a long story” that he won’t go into. Mark is still a little nervous and has not given me permission to share anything but general information, but we talked for almost two hours. If he had not been pushed into getting breakfast with us, “important people might have come by and taken him home”, but he really was ravenous. He was a bit afraid he would miss them. He doesn’t like people telling him what to do, has a couple of “angels” from the Church of God that regularly visit him trying to get him to seek help. Mark said he has been homeless maybe 1 or 2 years. I don’t really think he knows. He says the police have made him move three times in the past week. They’ve taken his stuff but left him behind, or when he was out of stuff, simply told him to go somewhere else. So he moves around, but always nearby. Some of the other homeless affectionately call him “Moses” but they all help look after him. Mark wears a short ponytail in his beard and says he another in the back, but he did not show it. Mark does not understand why those that don’t bother anybody can’t just be left alone, but he claims Scott as a friend who has “known me a long time,” and seems to be coming out of his shell with the extra attention. Below are some pictures. There were other homeless there, but some don’t want to be pictured. One said he didn’t want his family to know. “I’m not supposed to be here” meaning homeless. They think he is working somewhere else, I believe. Scott Steve Guy Mark Steve W.
Scott provided the food and shirts (hanging on fence). 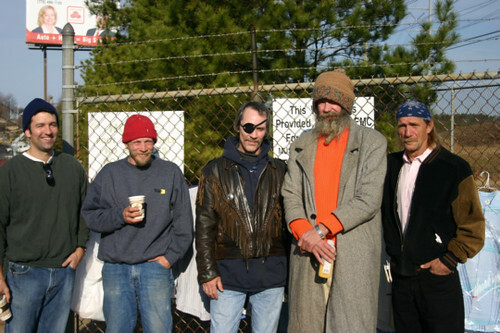 The gentleman on the far right is the same Steve that was featured in the video in my last post, “Marietta Homeless Steve Talks about Mark,” the same Mark standing next to him. Everything Mark is wearing is recently donated. Guy has been homeless only 3 weeks. I liked him immediately. Actually I liked them all immediately! The sign says “This walkway is provided by Cobb EMC for access to the MUST/Urban Action Facilities. (Travel at own risk)” The sidewalk is not on the road right-of-way, but the homeless get rousted out anyway. I was asked by Steve (with the cup) to thank Cobb EMC for the use of the paved walkway and for the access they have granted. He recognizes the public service Cobb EMC has done here. 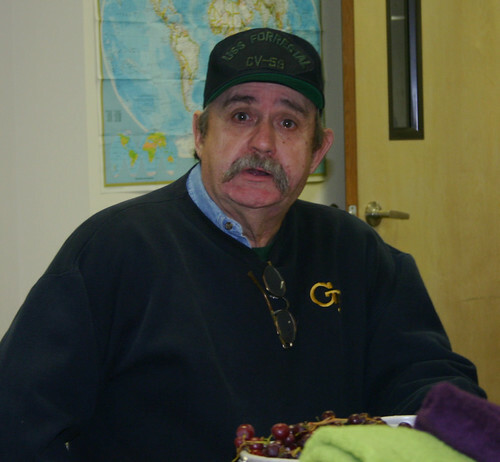 Steve has a 2 year and a 4 year education in N.C. and often gives legal advice. He is writing a “coffee table” book and has written several letters to the local news editor, none published. Major was in the earlier video also, but was seen only briefly. The bible in his pocket goes wherever he goes. Both are homeless. Elizabeth was named after Elizabeth Inn. 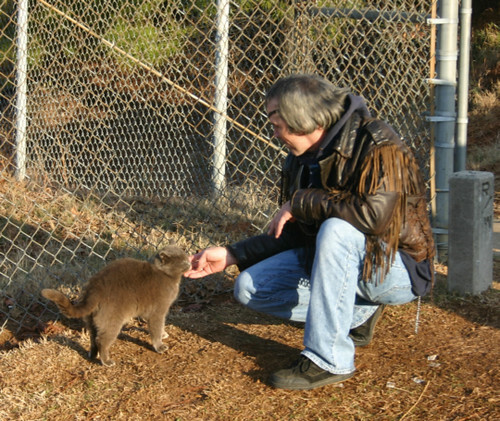 Mark calls her his cat, but in truth, I think she is loved by all the homeless in the area. 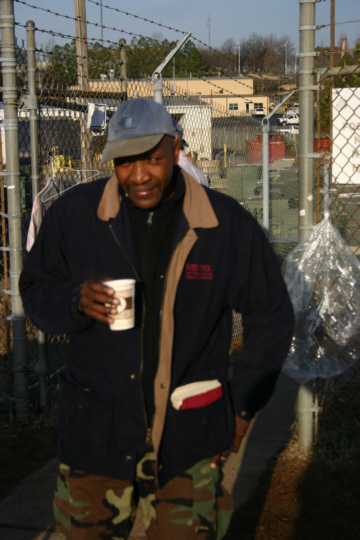 Al is a homeless veteran, still waiting for his papers, but they are in route. The donated cap is Navy, but he was actually Army. This picture was taken last week at our church.